Animals have to deal with probabilistic and volatile rewards in everyday life for survival. However it is not well understood how the brain encodes probability and volatility information. To study this problem, we trained two monkeys to learn a visual cue-reward association task in which a set of well-learned simple shapes preceded the delivery of rewards. The amount of reward predicted by these shapes could be probabilistic or volatile. The monkey learned to make consistent responses for fixed cues and to follow the changes of reward value or probability for volatile cues. We recorded from neurons in the orbitofrontal cortex (OFC). We found their activity during the cue presentation reflected the reward expectation, volatility and probability associated with the visual cues. These cue properties were represented by distinct neuronal populations. As a contrast, during the period before the animals made their responses, the activity of OFC neurons mostly represented the reward expectation, but not the volatility or probability. This study demonstrated the neural substrates of probabilistic and volatile reward information in OFC. Dr. Yang received his B.S. in biochemistry from Fudan University in 1997. In 2003, he received his Ph.D. in Neuroscience from Baylor College of Medicine, Houston, TX. He then did his postdoctoral work at the University of Washington, Seattle, WA. In 2008, he became a staff scientist in the Laboratory of Neuropsychology at the National Institute of Mental Health of USA. 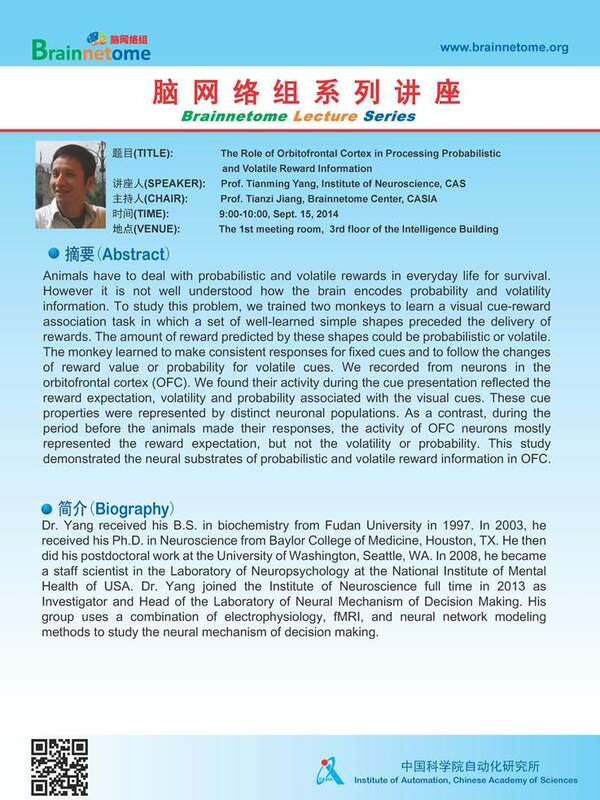 Dr. Yang joined the Institute of Neuroscience full time in 2013 as Investigator and Head of the Laboratory of Neural Mechanism of Decision Making. His group uses a combination of electrophysiology, fMRI, and neural network modeling methods to study the neural mechanism of decision making.